Protein World has taken the sports nutrition world by, well, KIND OF storm. It hasn’t exactly blown ME away personally though. The products I’ve tried so far, which are the Slender Blend Protein, and the Slender Blend capsules, were both sort of underwhelming once you peeled back the gorgeous packaging. It’s almost like my ex- it looked great on the surface, but underneath, the real substance was unimpressive. I was hoping Protein World Pre Workout would be a different story. Was I pleasantly surprised? Let’s dive into the taste first. Does Protein World Pre Workout Taste Good? I don’t know about you, but anything named ‘Summer Fruits’ has my attention right off the bat. I’m thinking instantly pineapple, mango, berries, and coconut. Even though coconut isn’t a fruit. Er. Is it? Lol yeah it is. Never mind. But yeah. I was expecting a sort of tropical punch. Like a white wine Sangria maybe? Yeah that would be good. Sangria is awesome. This pre workout doesn’t taste quite like my favorite Sangria from Shelley’s, but I think it DOES taste pretty good. I think Protein World Pre Workout has good sweetness, perhaps even too much sweetness. And that’s coming from someone with a HECK of a sweet tooth. So if you like sweet, you’ll really enjoy this pre workout. The fruits themselves that I could pick up are (as expected) pineapple, coconut, maybe some pear, and definitely cherry. I enjoyed the combination of fruity flavors that I was getting from this pre workout. So the taste checks out. But how does it perform? Well. This pre workout definitely ‘works’, I can say that much for certain. You would hope so with these big scoops. 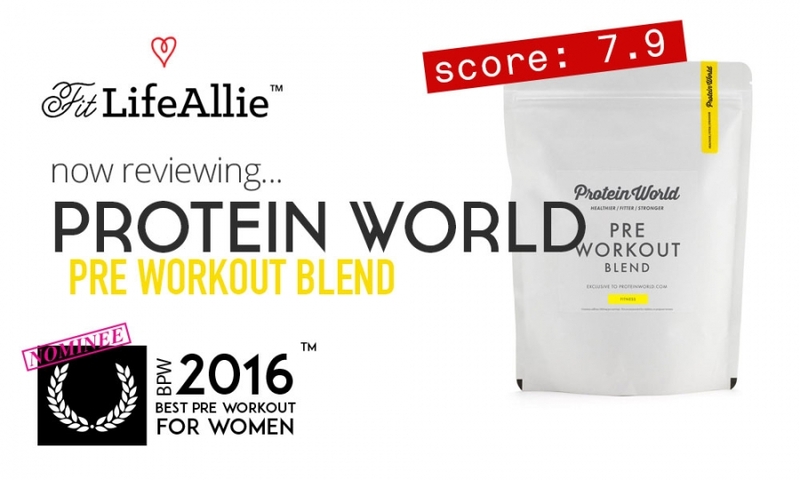 Of all the companies that I expected to make a ‘big blend’ pre workout, Protein World wasn’t really one of them. But this company went ahead and churned out one of the biggest scoop sizes I’ve seen since Pre Kaged (read my Pre Kaged Review for the most thorough Pre Kaged Review around). I was actually hoping for a little MORE performance from Protein World Pre Workout Blend because of that big huge scoop size. It’s like. If you ingest THAT much powder, I want to feel like I’m shot out of a freaking cannon! I didn’t necessarily feel that way with this pre workout. But. That’s not to say I didn’t like it. Because I did. I took a big ‘ol scoop of Protein World Pre Workout Blend before my 5 mile run today (I know, so much CARDIO from me lately…usuallly I’m ‘clangin’ and bangin’ in the weightroom), but, alas my old joints have forced me into cardio state. So the thing is. I had a great run. Don’t get me wrong. The focus was But what this pre workout is probably better suited for is weights. And also better suited for GUYS. Let me explain. See what I mean? Are you putting down your pitchforks now? Lol. I though so. I mean. Ladies. What the heck do we want anything to do with D-Aspartic Acid for crying out loud? Almost as bad as that, what do we possibly want to do with 3 entire grams of actual creatine monohydrate? Like. They didn’t even BOTHER with a form of chelated creatine, or better yet a creatine hydrochloride. They just went with straight up creatine monohydrate. Like turn us all into marshmellow women why don’t you? Ugh. It’s awful. Even 1 gram of creatine monohydrate turns me into such a pudgy bloated muck. But. I suppose we should try and find some bright spots in the formula right? I guess if I were a dude this formula would honestly be pretty great. The citrulline and arginine in Protein World Pre Workout Blend would provide a nice pump I’m sure. The choline certainly is dosed heavily at nearly an entire gram (good focus, that’s for sure), and BCAA and creatine would really keep you pushing hard until the end of any strength training session. Oh yeah. And the DAA would jack up your testosterone nicely. Insert monkey with hands over eyes emoji here. To summarize, this formula is just not for me. Or really any other chick trying to get lean. This is a traditional bodybuilding supplement for putting on mad muscle and mass. No thanks Protein World. No matter how bad the product on the inside (well, not really BAD just bad for me), I still have to give Protein World the credit where credit is due. Their packaging is totally on point. The white just represents such purity to me. It’s a fact that Protein World Pre Workout literally one of the best-looking stand-up pouches I’ve seen in my day. The matte white is simply stunning. The yellow accents scream out to you in a concentrated expression of color. It’s fantastic. The Protein World logo is as stylish as ever. And the choice of fonts and layout all around is second to none. I tip my hat as always to the Protein World team for creating some of the best LOOKING supplements around.